SSC JE Recruitment 2016, SSC Junior Engineer online form, SSC JE Form Last date change, Fill Application form at ssc online: The official notification for the recruitment of Junior Engineer JE is released by the Staff Selection Commission SSC for the year 2016. It is noted that the official announcement is issued by the Staff Selection Commission on 30th September 2016. 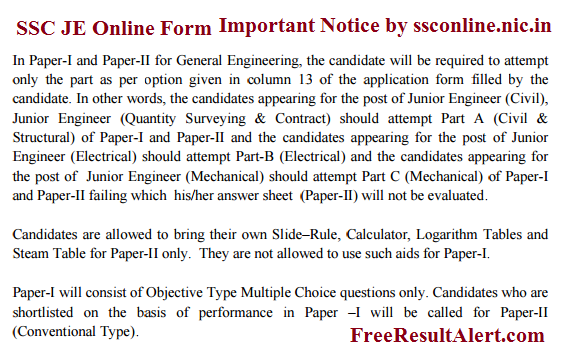 The recruitment is conducted for the post of SSC Junior engineer Registration Form(SSC JE Form) in various government departments.The Electrical, Civil, Mechanical branches can download the notice and news pdf in Hindi & English both. The Junior Engineer exam of SSC is a two stage exam. First stage – Common written exam and this is an online based exam. This is an objective type exam for 200 marks. Second stage – Written exam and this is offline mode. This is conducted for 300 marks. Make the application fee Rs.100 through either by online or offline. There is no fee for female, SC, ST, Ex Service man and PWD candidates. Submit the SSC JE online application 2016.